In the United States, 30-40% of teachers leave the profession during their first five years. This includes the exit of promising teachers, many who have been identified as exemplary, but who have come to feel frustrated, overwhelmed, or under-appreciated. Research suggests that excellent teachers who stay in the profession had experiences during their novice years that contributed to their retention. These include: mentoring and collaboration, belonging to professional communities, self-initiated growth plans, and connections with external networks of teachers. These reasons for staying in the profession align well with the experiences of participation in Writing Project activities. 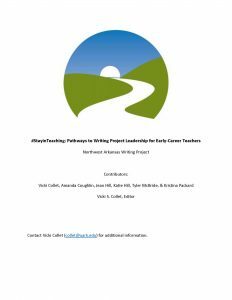 We are vexed by concerns about lost potential when promising teachers make an early exit from the career, and we feel certain that being involved with Writing Project leadership could curtail this exit. A combination of online surveys, face-to- face focus groups, and summer retreats helped us identify what our Writing Project site has provided that has been helpful and also helped us find our blind spots – those things that have kept novice teachers from participating. This monograph describes our plan for cultivating young teacher-leaders and the journey we took to develop that plan. By sharing our process and outcomes, we hope to support other Sites in their desires to involve promising young teachers in ways that will curb their exit from the profession. Because the path to leadership that we’ve developed for early-career teachers involves incremental steps rather than commitment to a month-long institute, Sites might also find our ideas helpful as they consider alternative pathways to leadership for the various teacher-groups they serve.